WASHINGTON/JERUSALEM (Reuters) – President Donald Trump told Israeli and Arab leaders on Tuesday that he intends to move the U.S. embassy in Israel to Jerusalem, a decision that breaks with decades of U.S. policy and risks fuelling violence in the Middle East. Senior U.S. officials said Trump on Wednesday is expected to recognise Jerusalem as Israel?s capital while delaying relocating the embassy from Tel Aviv for another six months, though he plans to order his aides to immediately begin planning such a move. U.S. endorsement of Israel?s claim to all of Jerusalem as its capital would reverse long-standing U.S. policy that the city?s status must be decided in negotiations with the Palestinians, who want East Jerusalem as the capital of their future state. 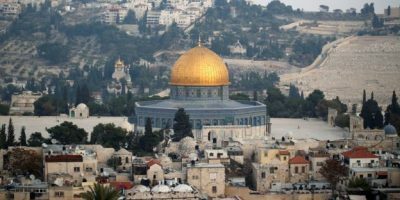 The international community does not recognise Israeli sovereignty over the entire city, home to sites holy to the Muslim, Jewish and Christian religions. Palestinian President Mahmoud Abbas, Jordan?s King Abdullah, Egyptian President Abdel Fattah al-Sisi and Saudi Arabia?s King Salman, who all received telephone calls from Trump, joined a mounting chorus of voices warning that unilateral U.S. steps on Jerusalem would derail a fledgling U.S.-led peace effort and unleash turmoil in the region. The White House said that Trump had also spoken with Israeli Prime Minister Benjamin Netanyahu, a longtime proponent of a U.S. embassy move to Jerusalem. Netanyahu?s office did not respond to a request for comment, but a senior Israeli minister welcomed Trump?s decision while vowing that Israel would be prepared for any outbreak of violence. White House spokeswoman Sarah Sanders said that Trump, who promised during the presidential campaign to move the embassy in Israel, would give a speech on Wednesday about his Jerusalem decision. ?The president I would say is pretty solid in his thinking at this point,? she said, declining to provide details. Trump notified Abbas ?of his intention to move the American Embassy from Tel Aviv to Jerusalem,? Abbas spokesman Nabil Abu Rdainah said. Abbas, in response, ?warned of the dangerous consequences such a decision would have to the peace process and to the peace, security and stability of the region and of the world? and also appealed to the Pope and the leaders of Russia, France and Jordan to intervene. The Jordanian monarch, whose dynasty is the custodian of the Muslim holy sites in Jerusalem, told Trump that moving the embassy would have ?dangerous repercussions? for the region and would obstruct U.S. efforts to promote Israeli-Palestinian peace talks, according to a palace statement. King Salman stressed to Trump that any U.S. announcement on the status of Jerusalem would ?inflame Muslim feelings all over the world,? the Saudi Press Agency said. None of the leaders? statements said whether Trump specified the timing of an embassy move, a notion supported by successive governments in Israel, a close U.S. ally. But U.S. officials, speaking on condition of anonymity, said Trump was expected to sign a national security waiver – as have his predecessors – keeping the embassy in Tel Aviv for another six months but would commit to setting the move in motion. However, he was not planning to set a specific timetable, the officials said. The Trump administration would need time to overcome logistical issues such as lack of a secure embassy building and staff housing in Jerusalem, according to one U.S. official. Trump appears intent on satisfying the pro-Israel, right-wing base, including evangelical Christians, that helped him win the presidency but was disappointed when he delayed the embassy move in June. No other country has its embassy in Jerusalem. Israel captured Arab East Jerusalem in the 1967 Middle East war and later annexed it, an action not recognised internationally. Israeli Intelligence Minister Israel Katz, who met last week with U.S. officials in Washington, told Israel?s Army Radio: ?My impression is that the president will recognise Jerusalem, the eternal capital of the Jewish people for 3,000 years, as the capital of the state of Israel.? Asked whether Israel was preparing for a wave of violence if Trump recognises Jerusalem as the Israeli capital, he said: ?We are preparing for every option. Anything like that can always erupt. If Abu Mazen (Palestinian President Mahmoud Abbas) will lead it in that direction then he will be making a big mistake.? Asked whether Trump recognised that his Jerusalem decision could spark violence, Sanders said: ?A number of things have been looked at that have been weighed into the president?s decision.? Senior U.S. officials told Reuters some officers in the State Department were also deeply concerned and the European Union, the Palestinian Authority, Saudi Arabia and the Arab League all warned that any such declaration would have repercussions across the region. Turkey threatened on Tuesday to cut diplomatic ties with Israel if Trump recognises Jerusalem. Katz took to Twitter to reject Turkey?s threat and reiterate Israel?s position on the city, which is one of a long list of stumbling blocks in years of failed peace talks with the Palestinians. A U.S. official said the consensus U.S. intelligence estimate on U.S. recognition of Jerusalem as Israel?s capital was that it would risk triggering a backlash against Israel, and also potentially against U.S. interests in the Middle East. It is also likely to upset an Israeli-Palestinian peace push led by Trump?s son-in-law and senior adviser, Jared Kushner, in pursuit of what the U.S. president has called the ?ultimate deal.? The initiative has made little progress. The White House said in a statement that in calls with Israeli and Arab leaders, Trump ?reaffirmed his commitment to advancing Israeli-Palestinian peace talks? and ?underscored the importance of bilateral cooperation with each partner.? Arab criticism of Trump?s plan contrasted sharply with the praise Washington?s traditional Arab allies heaped on him at the beginning of his administration. They saw Trump as re-engaging in the region after what they perceived as former President Barack Obama?s distancing of himself from them, as well as taking a tougher stand against Iran. The European Union?s top diplomat, Federica Mogherini, said on Tuesday that ?any action that would undermine? peace efforts to create two separate states for the Israelis and the Palestinians ?must absolutely be avoided.? U.N. Secretary-General Antonio Guterres has ?consistently warned against any unilateral action that would have the potential to undermine the two-state solution,? U.N. spokesman Stephane Dujarric told reporters in New York.